Dallas Braden is kind of back in the news for the third time this season. The first time was because of the altercation Braden had with Alex Rodriguez when the slugger trotted across Braden's mound on his way back to first base. This prompted a war of words between the two which reached its peak when Braden's grandma told A-Rod to "stick it." Nice mouth, grans. Then Braden threw an improbable perfect game. 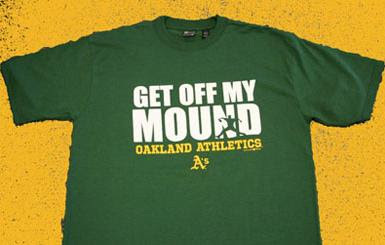 Now he's back in the news because he came out against the A's new "Get Off My Mound" t-shirt referring back to his words during the scuffle with A-Rod. "They're trying to generate revenue, trying to get butts in the seats, I can see that," Braden said. "It's almost like, at what cost do you do that? They didn't have permission. They were told on multiple occasions that, no, it's not a good idea. It's not going to be approved. They just kind of put the horse-blinders on and ran with it." Braden would go on to argue that the shirt is pitting himself and A-Rod against each other. Of course the shirt wouldn't exist if Braden hadn't coined the phrase while yelling at A-Rod and almost inciting a brawl. So A-Rod has to be pretty miffed too, huh? "I hope I get a cut," Rodriguez told reporters. Not only isn't A-Rod upset by the shirt but he broke out in laughter when Robinson Cano sported the shirt before Monday's game against the A's. I reluctantly like Robby Cano a little more now. Great. Also, if anybody in the Oakland area is reading this, I'll take a large. Admit it, you wish Alex and Robbie were Angels. Too bad. We have them and you don't. 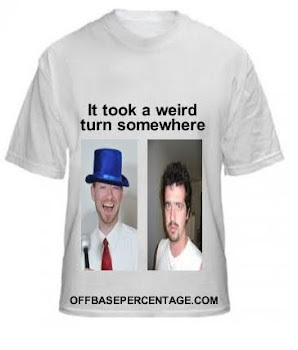 You can check eBay since they stopped selling the shirt now.